As part of your Five Star business checking account, you have access to a Visa debit card. This is a great way to simplify your business by writing just one check per month for all your purchases. 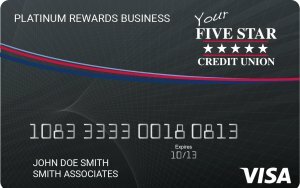 Business members can also earn one reward point for every dollar charged on a Five Star VISA® Platinum Rewards business credit card. Points can be redeemed for valuable merchandise, free travel, and popular restaurant gift certificates. Enjoy low interest rates (9.99%) and VISA is accepted everywhere. Multiple cards are also available for key employees off your master account.